LA IMAGEN PERTENECE AL PUEBLO was inspired for the automatic production of an iconic series, which exposes the veneration of the image as an artifact. 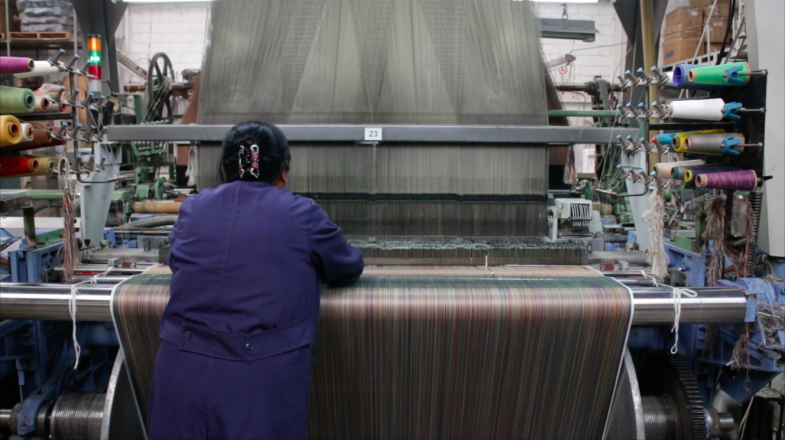 Is a video documentary filmed in a textile factory in Mexico City in which Bárbara focuses on the weaving production of the image of the Virgin of Guadalupe, a national emblem and controversial symbol to express Mexicanismo. The image of the Virgin of Guadalupe is part of the popular culture of Mexico and can be found reproduced, recycled and reappropriated in mugs, t-shirts, mural, posters and, as we discovered in this film, also converted in multiple devotional tapestries. Installed in a textile grid the image of Guadalupe becomes a tight unit of identical images, giving the impression that could extend almost endlessly. LA IMAGEN PERTENECE AL PUEBLO reflects not only about the legend and superstitious regard to an image but also, and perhaps primarily, about the time involved in the textile production and the relation between humans and machines, magic and technic. LA IMAGEN PERTENECE AL PUEBLO (The image belongs to the people), Video HD, 8min, 2016. Produced thank to the support of Le Fresnoy, Studio des Arts Contemporains (France) and Textiles Castell (Mexico).